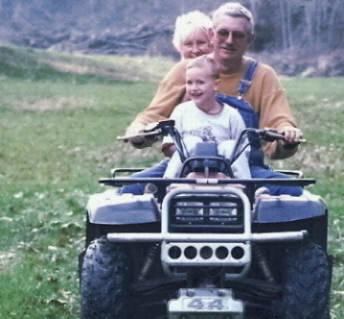 ATV riding in all seasons is great family fun on our PRIVATE farm roads. Buffalo River country is perfect for 4x4 trails and dirt bike trails. We're a 3 generation fourwheeling family. Kid atv and youth atv offroad parks should provide great fresh air and outdoor scenery for riders of all ages. Choose a peaceful trail ride on our secluded gravel roads and avoid the crowds and dust on public 4x4 trails or dirt bike trails. Join the many families with young children and teens that gather here to ride ohv, orv, utility and sport atvs of all kinds when they stay at our comfortable cabins. It is required that all children under sixteen years of age wear a helmet while riding and are under strict adult supervision. It is also recommended that all equipment be in good working order for the safety of all riders and passengers. Please also be aware that North West Arkansas is rough, steep, and bluffs rise up along the rivers and streams and that care should always be used while moving about the property in any way. We also require a signed release.